There was a carrot crisis earlier this year at Griffins Hill Yoga Retreat. Clara, our resident Cardigan corgi, joined us for an overnight holiday in Melbourne, which meant she was absent from her vegetable garden minding duties. Of course the wallabies, as smart as they are, took full advantage of the unguarded garden. In just one night they ate all the greens from the carrots. By this stage the carrots were almost fully developed so we had no choice but to harvest them. Bucket loads of carrots were gathered and washed by Mayuka the diligent WWOOFer (willing worker on an organic farm). The question was: what do we do with all these carrots? A couple of carrot cakes made no dent on the supply so my thoughts turned towards preserving the carrots for future use. With help from The Art of Fermentation by Sandor Ellix Katz, we decided to try to ferment the carrots along, with some other vegetables, in a brine. This sounded easy: no cooking, no bottling and no particular temperature required . And to my surprise, it was. According to Harold McGee, author of On Food and Cooking, preserving based on fermentation uses a plant’s naturally-occurring microbes, which flourish with the absence of air. The lack of air supresses the growth of microbes that cause spoilage, thus leaving most of the plant material – including vitamin C – intact for consumption. The fermentation process adds vitamin B and a pungent aromatic aroma to the brew. 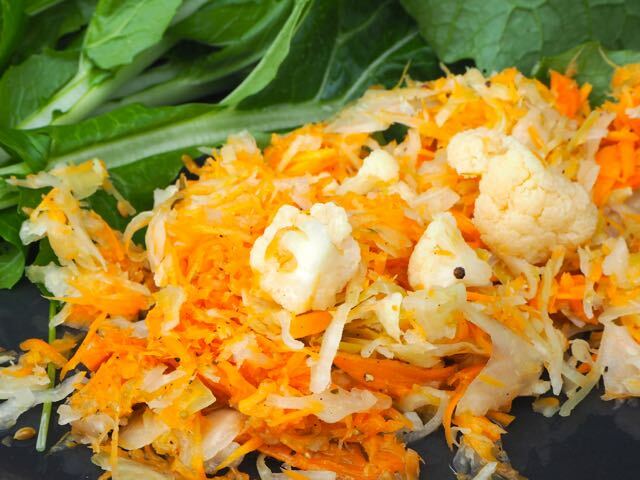 Fermented vegetables are more than just tasty. Research into the byproducts of fermentation points to impressive health benefits. Korea is famous for its spicy and sour fermented side dish, kimchi, so it’s no surprise that Kyung Hee University in Korea has released a research paper claiming probiotics and their fermented food products are good for health. The health benefits include enhancing the immune system, making nutrients more readily absorbable, helping symptoms of lactose intolerance, and reducing allergic reactions and the risk of certain cancers”. Find an airtight fermentation crock. A crock was traditionally an earthenware vessel. For fermentation you will need a water-tight crock large enough to hold your vegetables and brine. My crock comes from Bendigo Pottery. I highly recommend it as it comes with weights to ensure the vegetables are always submerged, plus it has a water seal around the rim. When I ferment, I use a 31cm diameter, 38cm high crock. Adjust your volume of vegetables to fit the size of your crock. I make a big pile on the bench because I haven’t found a bowl large enough to mix them in. Pack the vegetables tightly into the crock until it is full. To make the brine, dissolve 15 teaspoons of salt in 500ml of hot water. Add enough cold water to cover the vegetables. The water must cover them so they are not exposed to air. Place a weight on top of the vegetables. This will help keep them submerged. Put the lid on. My crock has a water seal that allows the gasses to bubble out of the crock, yet prevents oxygen entering the ferment. After about 24 hours the fermentation process begins and bubbles rise to the surface. This lasts about four or five days. Then you can sample the fermented vegetables. They should be crisp and pleasant to taste. You can season as required with more salt. How do I know if the fermentation has worked? If your vegetables are mushy or appear to be covered in fungus, or taste really bad, throw them away. It is not recommended to eat a lot of fermented vegetables in one go, so add them to salad or other dishes and eat only a little at each sitting. The vegetables can remain in the crock, covered with brine, for up to one year. My first batch of fermented vegetables only lasted six weeks. Our retreat yogis really loved giving them a go. I served them with lunches and dinners. One person reported having less reflux than usual, and they said they were able to eat food they normally couldn’t, such as tomatoes and onion. It was tasty confirmation of the health benefits of fermented vegetables. If you try out my recipe for special fermented vegetables, I’d love to hear from you. Send me an email at . Happy fermenting! Join over 2,000 of your peers and get fortnightly articles delivered to your in box.